Just drink. Taste of astringency with the feelings of Japanese stylishness. The tea tastes wide-awake astringency which symbolizes Japanese stylishness. You will like this bitter and hot tea when you get old. The clear yellow color feels literary like. Sencha contains vitamin C for beautiful skin (difficult to break in the heat and has stability), and has a lot of catechin that makes health benefits. 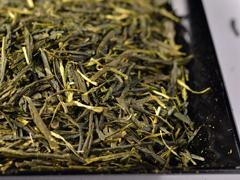 Distilled spirit with Sencha or drink green tea around imbibing, habitual drinker can check hangover. If you imbibe, just drink this.